NO MORE don't need much of an introduction – the legendary Kiel-based (No)Wave / PostPunk band project took the worlds dancefloors by storm with the release of their seminal single „Suicide Commando“ in 1981 which was later re-introduced to the Techno / Electro youth of the world, when Munich's DJ Hell famously reinterpreted the tune in 1998. Still actively touring and releasing on a regular NO MORE are now making their debut on the freshly launched Intrauterin Recordings-offshoot EL CABALLO SEMENTAL. The labels cat.no. 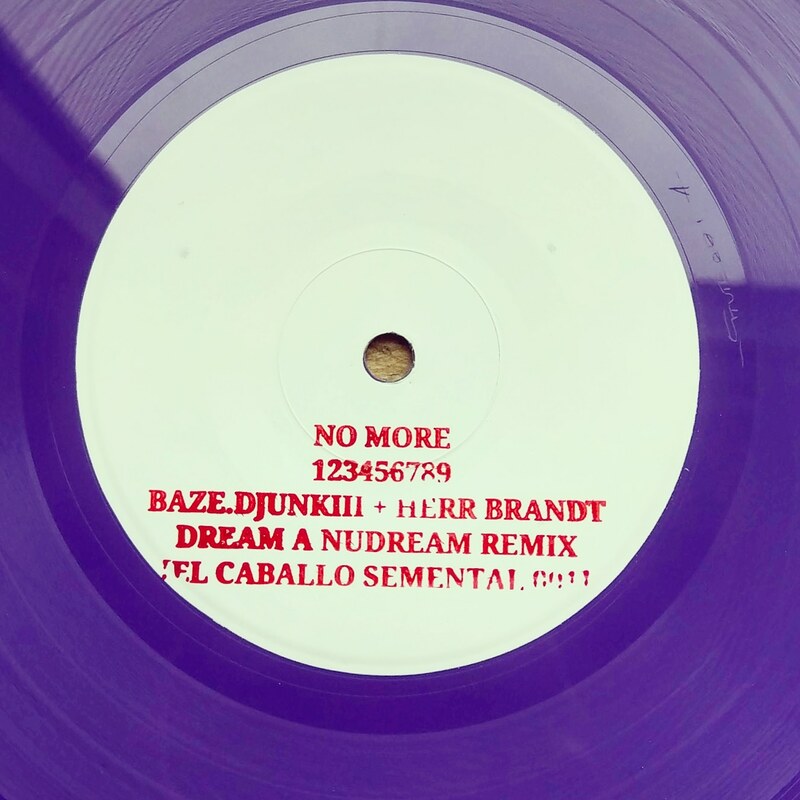 001 is a first time on vinyl release taken off NO MORE's „The Return Of The German Angst“ digital mixtape and sees one of the bands hit tunes being reworked in a unique, highly captivating manner, pressed exclusively as a limited to 200 copies whitelabel edition on purple / violet vinyl. „123456789 (baze.djunkiii + Herr Brandt Dream A Nudream Remix)“ exceeds the bands natural musical realm by far and transfers the song into MoombahGoth / DubWave territories previously unheard of, not only for a classic band like NO MORE. The rework picks up latest developments from the urban and bass music world whilst keeping the haunted vibe of the original songs chorus intact, slighty references NuBeat / PostPunk and Dub, adds lush, dreamy Cosmic guitar textures and even winks to the underground whistle and rave posse with a sweet as candy piano breakdown. In their conjunctional remix work we see Intrauterin Recordings-founder baze.djunkiii, quality electronic music activist and prolific DJ for more than 20 years, and Herr Brandt, founding member of the classic German Wave / Indie / Alternative outfit The Convent as well as of the praised underground Synth Pop / Minimal Wave band Sonnenbrandt, effortlessly merge the best of two musical worlds to create something new and captivating, like they used to do on the decks with their former BETA-ZERFALL parties which were the main and initial reason the two of them and NO MORE came together in the first place.